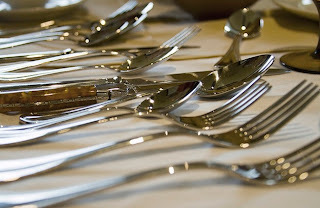 The correct use of cutlery denotes largely good education of the person. And as a rule covered all taken by the handle on top, fingers that are used to make cutlery are: index, thumb and middle. • The knife is placed to the right of the plate, with the blade facing inward. • The spoon is placed to the right of the knife with the concavity upwards. • The fork is placed to the left of the plate, with the points upward. • The cutlery is placed 3 to 4 cm. away on either side of the plate. • If we add at the table bread and butter, we place a knife crossed on the plate, so you can use smearing butter on bread. • It is important not to overfill the food covered, so as not to overflow. • The holder was used with the right hand, when used with food knife need not. If it falls to the ground covered should not be cleaned with a napkin or tablecloth, you have to do is pick you or the service personnel, and should replace it clean. Do not use cutleries to use a common container, all common containers usually have their own covered service.